I’m only guessing, that I believe in you more than you believe in yourself. If you want to be a public speaker of any kind, you can do it. If you have two other jobs and don’t think you have time to pursue your dream as a speaker, I know you do. Not to mention it won’t be long before your going from FREE to fee speaking and you won’t need those other two jobs, or at least one of them. Your speaking career, your passion can become your second job. Which if you want it to be will become your full-time job. Just start from where you are and go for it. Start from where you are at, make a list, and ask yourself what do I need to do to make this happen. And what can I start doing right now toward that goal. Download my book which will give you everything you need to make your living as a public speaker. Click HERE and get it now. Whatever you believe you can achieve. I know it’s a cliche, but only because it is true. No doubt you already have public speaking skills. Don’t compare yourself to great speakers and get discouraged. Whatever your goals are for public speaking, start where you are and get better. Public speaking at it’s finest is a combination of skills that can be developed and improved by anyone. It is true that some people have that charisma thing that you almost have to be born with to connect with people on the same level. But learning how to better connect with an audience is also something that can be learned and improved upon at any level. My book public speaking for fun and money is a manual that anyone can use to become a million dollar speaker. All you need to be a great well-paid speaker in the book. Click HERE and download it now. Please leave me a review when done. 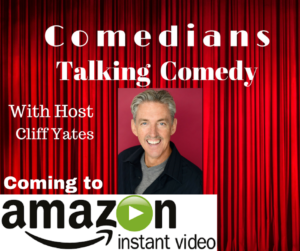 Comedians Talking Comedy is now Live on Amazon. Watch FREE on AMAZON! Watch now on Amazon by clicking HERE! Or click on the picture. Help us get to fifty reviews our first month. We started filming the show five months ago. Special thanks to Phil Luna and Luna Tunes for creating original music for the show. We have four episodes, let me know which is your favorite. Please leave a review on Amazon. Thanks to Rudy Moreno, Frazer Smith, Joey Medina, Marco Assante and Roger Rodd for a great season one! Check out the best Cuban cooking in the world! The original eighty-year-old recipe’s from Alba’s mom. These recipe’s originated in Cuba. Alba demonstrates how to cook these old school Cuban dishes. 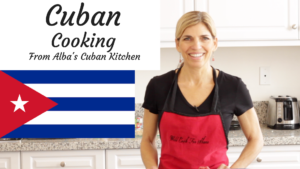 Follow Alba’s instruction, and you will be king or queen of Cuban cooking in your own home. It’s easy. CLICK HERE to watch for FREE on Amazon Prime.